Space per pupil: 100 sq.ft. 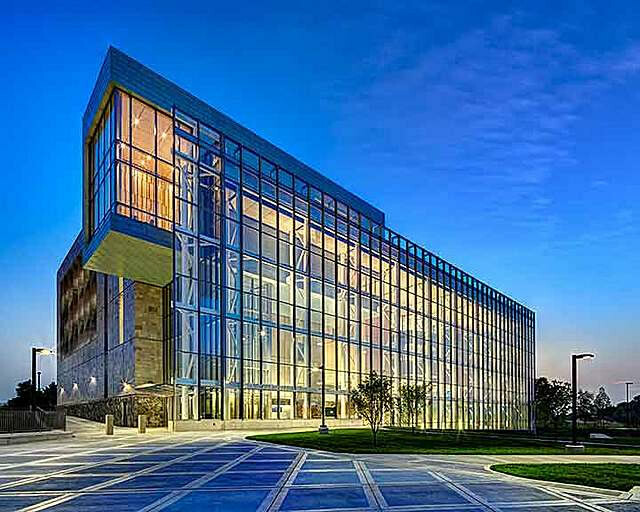 Grand Valley State University’s (GVSU) Mary Idema Pew Library, Learning and Information Commons represents a true shift in library design. Inspired by the changing needs of today’s students and the evolving skill sets required in the workplace, SHW Group designed the new 150,300 square-foot library, which opened summer 2013, not only to meet its users’ current needs, but also to bridge the gap between the classroom and the workplace. 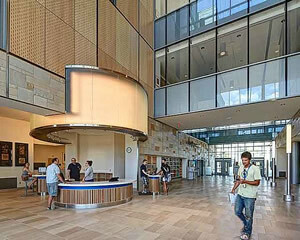 As the intellectual heart of the campus, the Mary Idema Pew Library, Learning and Information Commons provides an integral framework for the free access of knowledge and offers students the opportunity to continue learning after class is over in an environment that was created just for them. Virtually everything about the building design is informed by the habits, expectations and academic requirements of today’s students, resulting in a facility that that looks and feels much different than a traditional academic library. To understand students’ personal, social and academic needs, the design team embarked on an intense visioning process for the new library which began with benchmarking trips to state-of-the-art libraries across the country to pick up on best practices and opportunities for improvement at similar facilities. Furthermore, the team expanded their benchmarking to include retail, museum and hospitality spaces across the United States to provide a diversity of perspective. Exercises in mapping the program against multiple filters, including natural light, media type and user interactions, led the programming and ultimately, the organization of the building. 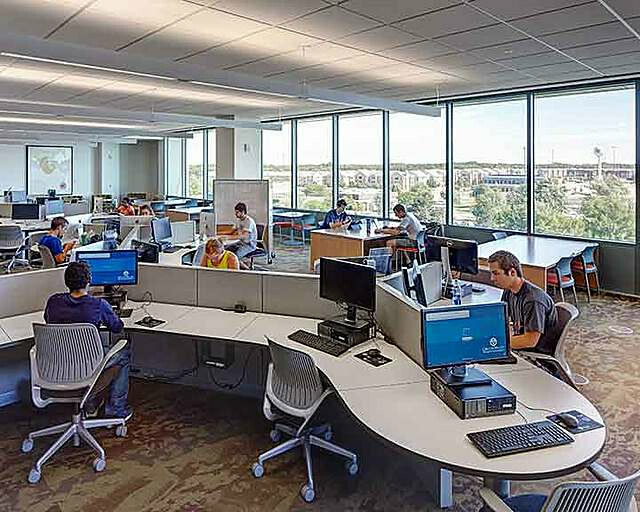 When it came time to determine building furnishings, SHW Group, GVSU and Steelcase teamed together to conduct primary research by studying spaces that support individual and small group work and observing how students and faculty used GVSU’s existing library. Ironically, a key design strategy employed at GVSU was “removing” the book. 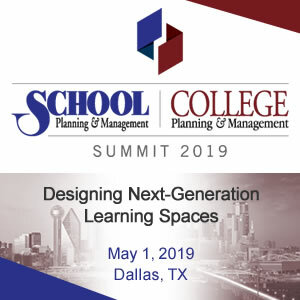 During early visioning sessions, designers identified that students needed more areas for both group and individual study. An Automated Storage and Retrieval System (ASRS) provided the solution. The ASRS has the ability to house up to 600,000 volumes in a 40’ high vault on the eastern side of the building that occupies only 3,500 square feet of assignable floor space, as opposed to the 60,000 square feet of assignable floor space required by conventional shelving. Patrons are able to request a book from virtually anywhere via the internet-based catalog and the volume will arrive at the service desk in less than one minute. In turn, the ASRS opens up the library footprint to accommodate the visionary program and 1,500 user seats. The printed book, however, remains an important resource for students and researchers in the humanities and in some social science fields. For these disciplines, 150,000 volumes are housed in open stacks on the three floors directly over the ASRS vault. Each collections wing holds a third of the library’s browsing collection, as well as formal and informal seating for quiet study. All of the books occupy one “stack” of floors, making wayfinding intuitive and simple. Students are able to check out volumes either at the main service desk or via self-check kiosks located at each building exit. 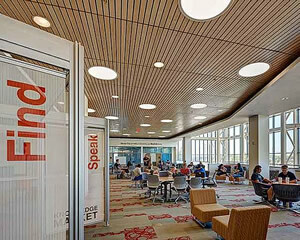 With the library footprint freed up by the ASRS, the design team focused on incorporating a range of spaces to give students a variety of “place” in the new library. The team created zones that are engineered to separate groups of users with different needs: quiet spaces for those who want no distractions and high-energy zones for multi-taskers and groups who want to be in the middle of things. Flexibility is a core design principle as well, and allows students to select the environment and tools that works best for their learning needs. Flexible furniture, equipment, service points, seasonal outdoor spaces, and lighting are incorporated throughout the building to encourage students to manipulate their environments based on their needs. Students can choose from 31 types of indoor and outdoor seating, including expansive window seats, upholstered niches and a wide variety of chairs that allow different postures for different tasks. Furthermore, the facility includes spaces like the Innovation Zone where each element in the space — tables, seating, equipment, and objects that stimulate creativity — was chosen to nurture student innovation. The building’s exterior is as impressive as its interior. 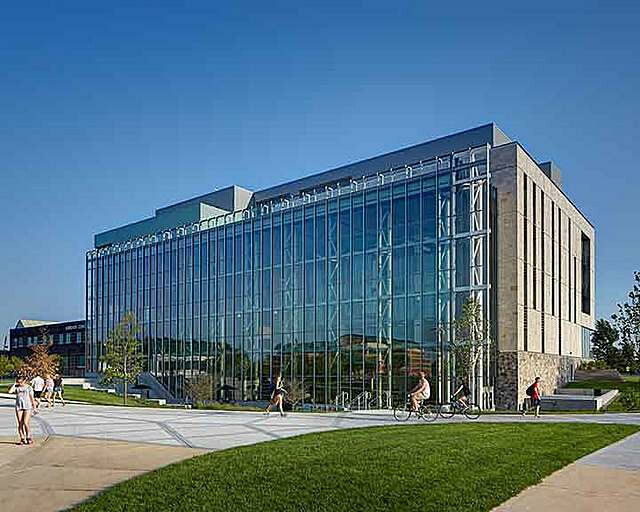 Natural stonework is used for the majority of the building, echoing a deep appreciation for Grand Valley’s rich architectural context and symbolically protecting the books within. The stone is reminiscent of the lost characteristics of the location: a once heavily wooded site cascading through deep ravines to the banks of the Grand River. Set in a random pattern, the material speaks to the inherent care and craftsmanship necessary for construction. The natural face of the stone encounters a rigid metal grid in which it is framed, offering a dialogue between tradition and contemporary, man and nature, and craft and machine. On the northern façade, the stone is contrasted by a 40-foot high glass curtain wall that steps down from the stone mass of the building, opening it to the campus’ central axis. Fenestration is integrated with program and the environment. Large punched windows are situated on the east, south and west elevations to identify individual and communal seating areas. These windows capitalize on the site’s solar income and incorporate solar shading louvers to manage the direct summer sunlight and minimize glare. During the day, the building is filled with natural light, which reaches 75 percent of interior spaces. At night, the building becomes a beacon, a transparent hive of activity and peaceful pursuit that draws users inside. It is a welcoming venue for the campus and the community when events are held in the multipurpose room or in the exhibition space in the Commons area. 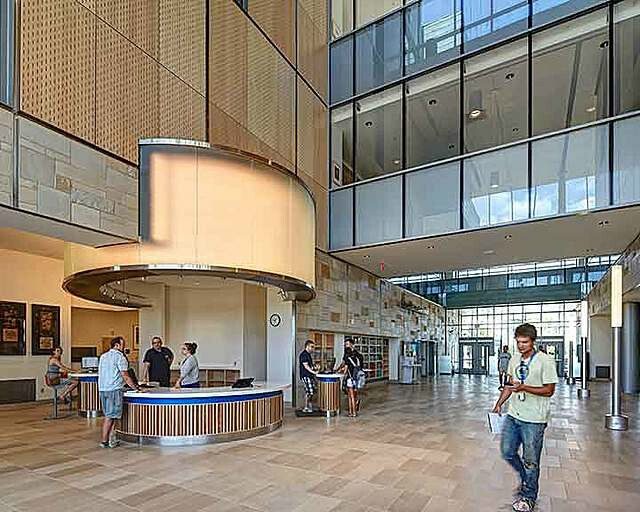 With aspirations for the highest levels of LEED certification, the building also is designed to further the university’s commitment to sustainability. Visioning sessions included specific sustainable design visioning to determine how to use sustainable features and in what places. SHW Group designed the building with a predicted annual energy use intensity (EUI) of 90 kBtu/ft2, which is a 44% improvement over a code minimum building. A partnership with GVSU and the U.S. Department of Energy’s Commercial Building Partnerships (CBP) program also identified additional areas that could give more savings over this already high performing value. This joint analysis and design effort has resulted in a building that should perform at a 50% improvement over the next generation of ASHRAE standards. The facility contains complex HVAC systems that have been optimized for energy efficiency including underfloor air distribution, demand controlled ventilation, radiant floors, enthalpy recovery wheels, a flat plate air-to-air heat recovery unit, wrap-around heat pipes, condensate heat recovery, and high-efficiency mechanical equipment. In addition, the facility includes high-level complex building automation controls, daylight harvesting, occupancy sensors, passive solar shading and active window shades to reduce glare and heat gain, and high efficiency plumbing fixtures. Enhanced commissioning services throughout construction verified that the systems were installed correctly and operate according to the design intent. A green roof; triple-glazed high performing glass; optimal building orientation; and exterior materials selected for longevity and low-maintenance round out the facility’s impressive list of “green” features. Landscape Architecture: Hamilton Anderson Assoc.